Rise Sport, a lifestyle brand inspired by the urban culture of the world’s game, is doing its part to spark a cultural revolution. Aside from Rise Sport’s mission to change the way the world’s most popular and celebrated game is represented here in the States, they are also dedicated to social change. “4 Social Change” Tee. 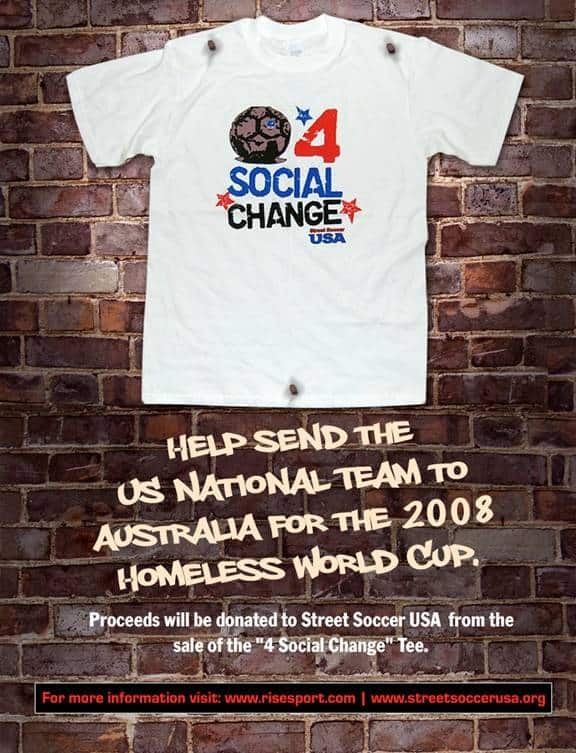 Proceeds from the sale of the shirt will benefit Street Soccer as they prepare to compete in the 2008 Homeless World Cup in Australia and with local programming. “Rise Sport and Street Soccer USA have come together because we understand the power soccer can play as a means for social change,” says Akbar Majeed, owner of Rise Sport.